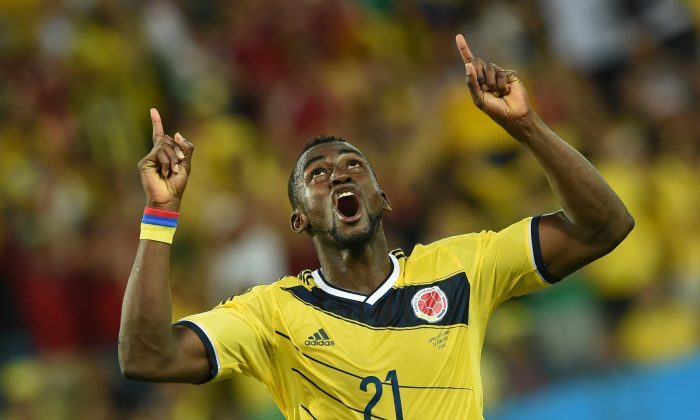 Jackson Martinez is interested in moving to Arsenal. The 27-year-old Colombian striker has scored 2 goals at World Cup 2014 so far, and 60 goals in 91 games for F.C. Porto. According to the Daily Express, Martinez supposedly told reporters in Brazil that Arsenal is his boyhood club, and he “would say yes” to a move. “I know that there have been discussions, but still no agreements,” Martinez said. See an AP story below. BOGOTA, Colombia (AP) — The euphoria in soccer-mad Colombia is deafening, and wonderfully contagious, ahead of Friday’s do-or-die World Cup match against host Brazil. Never before has the star-crossed nation made the quarterfinals. Some are even waxing poetic about World Cup unity accelerating the pace of 18-month-old peace talks to end a half-century of conflict that has claimed some 220,000 lives. Half the population seems to be wearing the canary-yellow national jersey, even on days Colombia isn’t playing. And the merrymaking, from singing in the streets to collective game-watching on huge screens in public parks, is often so unrestrained that many big-city mayors have imposed bans on alcohol sales on game days. The fear, of course, is that it all will be fleeting and the violence and intolerance that have long plagued the Andean nation will re-emerge at tournament’s end. Not since Colombia drubbed Argentina 5-0 in a 1993 World Cup qualifier has the South American nation of 48 million been so enthralled by the beautiful game. “Colombia is going to make it to the final because it has the fundamentals and preparation, and (the players) have great courage and desire,” said Leonardo Soto, a 23-year-old paralegal in Bogota. No country’s fan base is apparently as dedicated as Colombia. Out of 19 surveyed in a pre-World Cup poll done by YouGov.com for The New York Times. Just 6 percent of Colombians weren’t interested in the sport, followed by Mexico with 8 percent and Argentina with 10 percent. The United States, by contrast, had a 60-percent apathy rating. President Juan Manuel Santos is among the devoted, and planned to attend Friday’s contest. The Colombian team’s unselfish poise and grace are about the only thing Santos and his political nemesis, ex-President Alvaro Uribe, can agree on these days as they spar over the handling of peace talks with the Revolutionary Armed Forces of Colombia, or FARC. Aldo Civico, a Rutgers University anthropologist and conflict resolution expert, says “the joyful and intense expression of unity” around the Colombian team’s four-game winning streak has let people “transcend the political tribalism” that has defined Colombia’s violent history. It reminded him, he said, of how Nelson Mandela used South Africa’s love of rugby as a tool of post-apartheid reconciliation. The fear, of course, is that lacking a Mandela, the unity will evaporate after the last referee’s whistle sounds. No one, says former coach and player Alexis Garcia, wants to relive the anguish and shame Colombians felt after the July 2, 1994, slaying in a Medellin discotheque parking lot of 27-year-old defender Andres Escobar, who had knocked Colombia out of contention by accidentally kicking the ball into his own net in a game against the United States. He was shot six times by the driver of two suspected drug traffickers, one of whom had complained to him about his blunder 10 days earlier in Los Angeles. Michael Zimbalist, who with his brother Jeffrey made the 2010 documentary “The Two Escobars” about Colombian professional soccer’s tainting by drug lords including Pablo Escobar, says the nation deserves credit for largely cleaning itself up in the years since both Escobars were killed. It’s heartwarming, said brother Jeffrey, how football extends to a country’s sense of identity and has allowed the world to see a special side of Colombia it hadn’t known. Which is not to say that either brother believes drug money is all gone from the sport. In 2006, a drug trafficker affiliated with far-right militias named Gustavo Upegui was slain in his bedroom by a gun-wielding intruder. Upegui had been running the Envigado club just outside Medellin and had recently purchased the rights to an adolescent he thought had a brilliant future. In fact, that player currently leads all World Cup scorers with five goals.